Assemblywoman Lorena Gonzalez’s 2015 motor voter law is one of the most high-profile pieces of legislation she’s passed in a career full of them. Now, after a series of errors implementing the law, another San Diego lawmaker has introduced a plan to kill the program. Sen. Pat Bates, the Senate Republican leader, says the problems warrant a return to the old system, in which citizens can choose to opt in to registering to vote through the DMV, instead of having voter registration be automatic. She’s introduced Senate Bill 57 to make it happen. Bates has been outspoken about problems with the DMV over the last year, some of which involve the motor voter program and some that are unrelated. 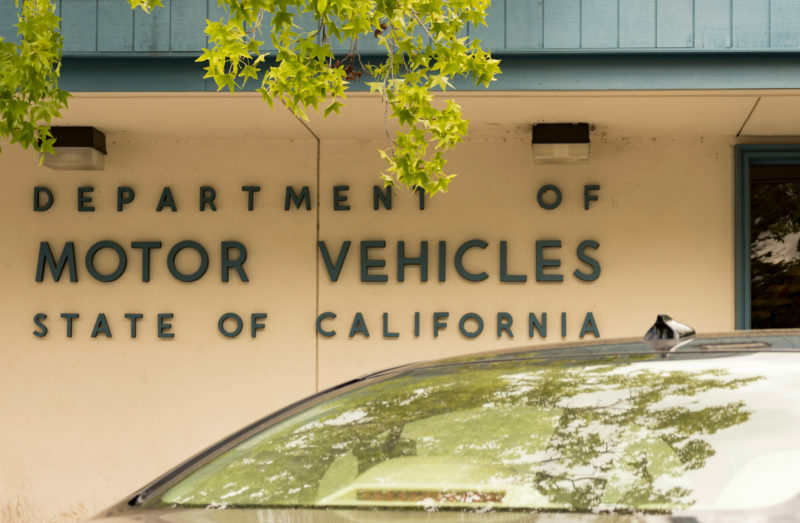 She and others called for a state audit of the DMV, which the Democratic-led Legislature ultimately rejected, although now an audit led by the state’s finance director is moving forward. Bates said that she decided to pursue a bill to kill the motor voter program before the audit is complete because she doesn’t have confidence the probe will be substantial. “I have called for the independent State Auditor to conduct a thorough audit of the DMV, but legislative Democrats did not approve it. Instead, the governor ordered a watered-down review to be conducted by members of his own administration. It’s better than nothing, but having the governor’s own staff review the work of his own appointees doesn’t give me confidence that any real reforms will be made,” she said in an email. Gonzalez criticized the move on Twitter as a Republican attempt to suppress voter turnout following astounding Republican losses across California in November. I asked Bates about that criticism, and she cited Secretary of State Alex Padilla’s concerns about the problems plaguing the program. Padilla, however, still supports the motor voter law. Bates said she does not believe her bill would impact voter turnout. “Registering to vote is easy. The 26th Amendment was ratified in 1971 by the states, and 18-year-olds have figured it out. We don’t need the DMV to take on a role that it is not capable of doing,” she wrote. Yet Padilla, who oversees elections, has directly attributed record turnout in the most recent election to the motor voter program and other efforts to make registering to vote and voting itself more accessible. Data from the secretary of state’s office shows that more than 727,000 new voters were registered to vote since April as a result of the law. Assemblyman Todd Gloria is pledging action in the wake of a blistering state audit on local governments’ response to San Diego’s devastating 2017 hepatitis A outbreak. The audit, which Gloria requested, concluded that the outbreak that sickened hundreds and left 20 dead might have been halted more quickly if county and city officials had acted with more urgency. Gloria has said VOSD’s reporting documenting bureaucratic fumbling as the deadly outbreak escalated helped motivate him to call for the audit. Now Gloria says he’s looking closely at state auditors’ recommendations. Auditors suggested that state lawmakers clarify that public health officers can issue directives to other agencies if deemed necessary to control the spread of disease, and that lawmakers enact legislation requiring health officers to promptly notify, update and share information with other public entities about outbreaks that may affect them. Gloria said he’s preparing to introduce legislation to address both issues, which auditors documented as points of confusion in the region’s response to hepatitis A.
Gloria said the audit also deepens his resolve to pursue legislation to address the state’s housing shortage and homelessness crisis in the new year. He cheered the state audit for what he described as an unbiased breakdown of the facts following a county after-action report that largely lauded its own efforts. County health officials said this week they remain proud of their response to the outbreak and that, while they believe details laid out in the audit were misleading, they agreed with its recommendations. The city’s chief operating officer also agreed with the recommendations and said the city looks forward to better clarifying its future public health work with the county. The State Bar plans to ask lawmakers next year to raise the $315 basic fee licensed lawyers must pay to fund the agency, a development unlikely to spark much holiday cheer among California attorneys. The annual bar fee has not increased in nearly two decades, and the agency has pointed to large budget deficits as one reason it needs additional revenue. While the bar has not identified the size of the fee increase it will seek, a recent staff report said a 32 percent hike of $100 would be needed to balance the bar’s 2020 budget. At the current fee level, the agency’s operating deficit that year would be $20 million. One San Diego lawyer in favor of a fee bump is David Cameron Carr, an ethics attorney who previously worked as a State Bar prosecutor and now defends lawyers before the agency. But whether lawmakers long critical of the bar for questionable spending, among other concerns, will be as receptive is another matter. The recent chairs of the two judiciary committees in Sacramento both said the results of an ongoing state audit of the bar will play a key role in how the fee issue is handled next year. “Many of us are looking to see if they have become more efficient and whether they are serious about improving issues related to the disciplinary process,” said Sen. Hannah-Beth Jackson, D-Santa Barbara. “They are going to need to be very clear with us about their financial condition, what the fee increase will be for and what their future looks like,” said Assemblyman Mark Stone, D-Monterey Bay. Assemblywoman Lorena Gonzalez, the San Diego Democrat who has chaired the powerful Appropriations Committee, declined to comment on whether she thinks the bar should get a fee increase. The expected debate about the bar fee will come amid some uncertainty about whether state bars nationwide will be able to charge lawyers mandatory dues for much longer. The U.S. Supreme Court recently directed the 8th Circuit Court of Appeals to re-examine its support for a mandatory bar fee in a case out of North Dakota. Sometime in the early-1960s, Mike Schaefer spotted another California license plate in the parking lot of Georgetown Law School, which is a couple blocks from the U.S. Supreme Court building in Washington D. C. It was David Gill’s. The two men were both from San Diego. They got to talking, stayed friends and, 55 or so years later, met this week in an official capacity. 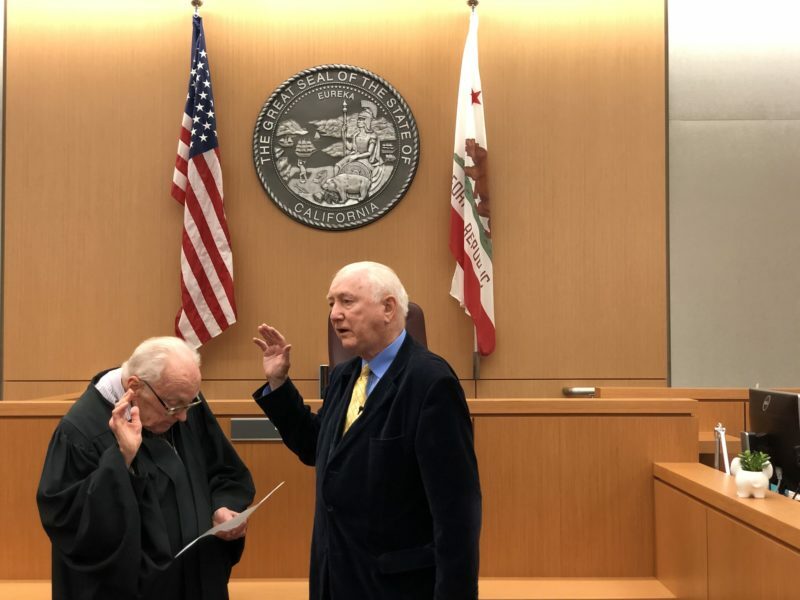 On Tuesday, Gill, a San Diego Superior Court judge since 1979, swore in Schaefer, a just-elected member of the California Board of Equalization. Gill had to wrap up a jury selection, so the ceremony started a few minutes late. Gill is a methodical judge who patiently talks to jurors about their duties to the law and justice. I was a juror in his courtroom a few years ago and, after much deliberation, helped acquit a man who prosecutors were going after in one of the most seemingly boneheaded battery cases you can imagine. Because that was the gimmick, Schaefer approached the bench and they began to talk about their ages. Gill is only 84, as of last week. Schaefer turned 80 in March. Gill, a modest and careful man, said there’s maybe a few other sitting judges older than he is. Schaefer – a former city councilman with a checkered past – claimed to be the oldest state employee. Then they traded some gossip. Because the story about the license plates came up, the judge mentioned he’d once considered ordering a plate that said “GILLTY” but was advised against it. Schaefer said he’s unhappy that State Controller Betty Yee doesn’t attend all of the Board of Equalization meetings. Lawmakers and assessors alike have been trying to eliminate the five-member board, which has been steadily stripped of its powers, though don’t forget that it hears appeals of property tax assessments, jointly administers alcohol and insurance tax programs and may have something to do with marijuana, though Schaefer wasn’t quite sure about that yet. The swearing-in was brief. The parking lot story was told again, for the benefit of the cameras. Gill said they’d run into each other not too long ago at a Saturday mass. The judge then said it’d be best for Schaefer to save anything political for the hallway outside of the courtroom. But Schaefer goaded the judge, as old friends do, until the judge finally said he planned to run for re-election. Out in the hallway, Schaefer said that in addition to mass, he’d also at some point run into Gill at Bully’s, the bar and steakhouse. He talked about the honor he’d just received and then talked about meeting various state governors, including Jerry Brown, who is two weeks younger than Schaefer, when they were both students at Berkeley. Gov. Jerry Brown told NPR he’s leaving the state with a budget surplus close to $30 billion. Politifact checked things out, and found he’s right. Brown’s been talking a lot about spending as he prepares to leave office. He also told the Associated Press that he is worried Democrats in the state won’t keep spending in check.